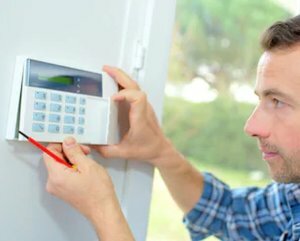 Home security and alarms have always been a consideration to protect your home, but it doesn’t have to be expensive. Luckily, there are some very good DIY security systems in this category that promise to provide a complete security cover around your home and protect it around the clock. If you are looking for a home security system, we’ve given our five best home security system recommendations here. All of them are superior quality products with a wide range of security features. You can go through the details and technical specifications of each product to see which is the one you that serves your needs best. These products are easy to install and operate. They don’t require a technician to install them; you can do it yourself within minutes. If you are more comfortable with a professional installation, just call ACME Locksmith or your local locksmith shop. We are eager to assist. 1) Affordability. Since most monitored systems are giving away the hardware, in exchange for three year monitoring contracts, these alarm systems need to provide a substantial savings over time. 2) No required monitoring contracts or monthly fees. None of our recommended home security systems require a contract, and all but two of our recommendations are absolutely free of any monthly charges. 3) Easy to use. They need to be able to be installed by most homeowners. 4) Active Notification. If a security system with no monthly contracts, the need for the system app to notify you when an alarm is sounded is a must. It also must allow you to view your home, via camera, after you are notified so you can make the right choice about what to do. This last point is important. Most of these systems will allow you to install a sim card so that the alarm system will call you or text you. This really is the ideal way to be alerted. But, it requires that you purchase a prepaid sim card, or pay monthly fees for a sim card, and that is what we want to avoid. Does it support your phone. Will it always notify you of a alarm when the app is closed, even after a phone power cycle. In some of DIY security systems the app must have been opened before it will alert you. In some of these systems the app’s alarm notification behaves differently depending on which type of phone you are using (Apple vs Android). You can find out how the app will work by asking the seller how the security system app behaves on your model of phone. Get the latest SimpliSafe pricing on Amazon. This frustration-free wireless home security system offers 24X7 alarm protection for your home. This product comes in a kit containing 5-12 components: a base station, entry sensors, keypad, panic button, motion sensor, and camera options. You can also purchase additional components individually. This offers a complete sense of security no matter where you are. The installation does not involve any tools or drilling. You can do it yourself in a few minutes. This smart security solution works in complete tandem with other smart home solutions such as Google Assistant, Alexa, and August Smart Lock. Installing this security system does not require to buy any subscription or service plan. There is no contract involved. This is a DIY home security system that offers hassle-free alarm system at cost-efficient prices. It’s surveillance system knows the difference between an intruder and a pet. This home security alarm system is reliable and easy to use. It sends you gentle reminders when you leave the window open and instant alerts when it detects a crisis. This smart security solution for your home has effective safeguards against downed WiFi, power outages, and other disturbances. This works like your personal security officer with a hotline connection with the police. This means your home has got complete protection from burglary or any other unwanted situation. 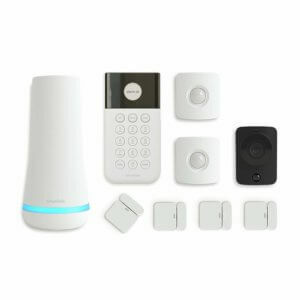 Among the crowd of home security systems, SimpliSafe Home Security System stands out because of its advanced features and high-level performance. It offers an effective security cover all around your home and makes sure that any attempt of unauthorized entry is met with an alarm and instant notification to the homeowner. If the situation warrants, the security system can also alert the police about the crisis. Anyway, you get a notification triggered from the area where the crisis was localized. You instantly understand which part of your home is under threat. Accordingly, you take your decisions to bring the situation under control at the earliest. Like all standard home security systems, SimpliSafe Home Security solution is an amalgamation of various sophisticated technologies and high-tech gadgets. In particular, it employs the services of PIR motion detectors, HD infrared video cameras, and WiFi. For free it only functions as an alarm system (sound). To receive notifications a monthly subscription is required, making it our least favorite of those we looked at. Bibene Alarm System is a highly sophisticated home security solution that you can install yourself without requiring the assistance of a locksmith. This is a wireless WiFi alarm system that sends an instant notification to you if there is any attempt to trespass your property. The device can be attached to an Alexa device and you can enable or disable this home security solution through voice commands. It is equipped with highly sensitive PIR motion sensors, which is expandable. This alarm set has 5 door contacts with door sensors. There is no monthly fee to be paid for this security system. It comes with the WP7 app, which uses an upgraded chip to offer a stable WiFi connection and keep your home security system online. This device works on the company’s own network of servers. This ensures a higher level of security to the data generated by your home security device. At the same time, it makes it easier to resolve any technical issue that may arise with respect to your device. The magnetic contact sensors and PIR motion detectors, which are standard parts of the device, detect any break-in attempt and activate the alarm. This deters burglars and potential intruders from making any more attempts at unlawful entry to your home. It has an SOS emergency function that makes it ideal for home, child, business, office, disabled safety protection. The PIR detector offers a 110-degree field of view but it is not pet-immune. WP7 app is an easy-install, which enables you to control the entire security system with your IOS or Android Smartphone. It sends you alarm triggered for a specific area so that you can track and take an informed decision about the steps to be taken to prevent any loss or damage to your home. It also boasts clock, arming delay, and timing the arming. 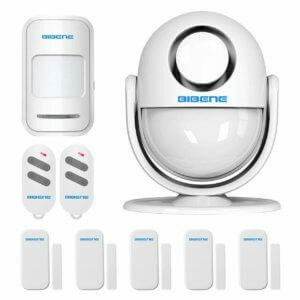 The Bibene Alarm System kit contains a PIR motion detector, PIR Main Panel, 5 Door sensors, and 2 Remote controls. It also contains 1 AC adaptor, backup battery, 1 user manual, mount, and adhesive tape. All sensors and remote controls are pre-connected with the main panel. There is no installation fee or any monthly monitoring charge. The security of your home will depend on home security systems you install. This home security solution is the best DIY home security system that provides free home security. Bibene Alarm System is a high-class product that offers a wide range of excellent security features. This product is sturdy, long-lasting, and weather-resistant. The installation is simple and easy. And, it is compatible with your home security and automation networks. This means it becomes a part of the overall automation and smart security solution that you may have already installed at your home. This home security system is highly versatile and works efficiently handling internet and power outages in a smart and intelligent manner. This is certainly one of those products that deliver what they promise. This is a truly high-performance smart home security solution that you can install yourself without needing the help of a professional technician. This device combines the best of motion sensing, infrared night vision, internet to provide you an integrated solution. This is extremely user-friendly and allows you to keep a round the clock watch on your home from anywhere in the world. It has a pet-immune alarm system that sends an instant alarm to you and the security service provider if it detects any abnormal behavior. It has fire and smoke detection system. This is a wireless device that runs on a battery, which lasts for about six months without needing a recharge. This DIY alarm kit can send you alarms through a number of mediums like SMS, phone apps and GPRS (cell phone) that makes sure that you never miss an alert sent by your home security device. It can be configured for use in any of the following languages: Spanish, Russian, English, Dutch, French, Turkish, and Swedish. The Golden Security solution comes in various kits that may include a control panel, wireless PIR motion sensors, wireless remote controller, wireless door sensor WiFi IP camera, wireless strobe siren, wireless smoke detector, power adapter, and English user manual. 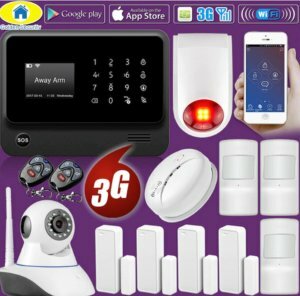 This is a 3G home alarm system that works on both Android and iOS mobile operating systems. Giving authorization is extremely easy with the help of the app that comes along with the product. The best part of this device is that it will automatically switch to GPRS in case there is no WiFi. If both WiFi and GPRS are non-functional, it will send you alerts through SMS. This home security device gives you the ultimate peace of mind as you know your home is well guarded by this smart security device which has been designed to provide effective and optimum security to your home. Its ability to detect smoke and fire helps you to keep your home safe from accidental fire. Golden Security DIY G90B Plus+ is a highly evolved product that envisages every aspect of your home security. It leaves nothing to chance. A burglar can’t expect to dodge its watchful eyes or its instant response on detecting anything suspicious. This product is available on Aliexpress, which is one of the largest online retail outlets based out of China and owned by Alibaba. The level of security to your home depends on home security systems you install. 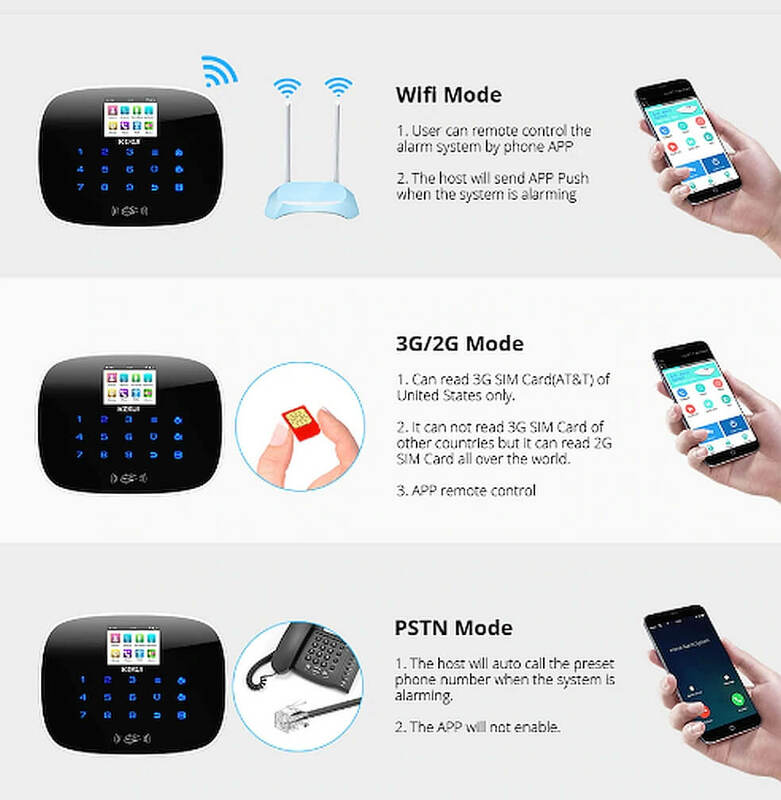 Golden Security DIY G90B Plus+ is the best DIY home security system that provides free home security. This is by far the best feature rich DIY home alarm system available. It is only in 2nd place on MY list because of its monthly fees for two features. Ring Alarm is a highly evolved home security system that puts you in complete control of your home security. It sends you instant alert on your smartphone when the windows or doors open or motion is detected. It also offers optional 24X7 professional monitoring. The Ring security devices can be managed with the Ring app, which can be used also to manage other Ring products such as the Ring Video Doorbell (see on Amazon). The protection to your home depends on home security systems you install. Ring Alarm is the best DIY home security system that provides free home security so long as you are not interested in keeping recordings of the video feeds. This home security solution is a versatile system that can be customized to your needs and additional components can be added to expand the coverage area and add additional security features to you’re the existing security system for your home. This is a Do-It-Yourself (DIY) home security solution that can be easily installed within minutes, without any tool or any locksmith assistance. You can do it yourself, and very easily. Ring devices works seamlessly with Amazon Alexa and you can operate this home security solution with your voice and Alexa smart assistant. This helps you arm and disarm the device without having to physically do it through your Ring app or the Ring Alarm Keypad. Ring Alarm Home security system is part of the smart home security devices launched by Ring, which has been a pioneer in the field of home security solutions and video doorbells. The company provides a range of top-end home security solutions that use sophisticated and high-tech components to design and create home security devices which are optimized for providing the highest degree of security to your home. The device uses HD infrared night vision cameras that capture and provide crystal clear images and videos of any door activity even in the darkness of the night. It is also equipped with highly sensitive motion detectors that send you an alarm as soon as it detects any movement in its field view. You will receive the alarm on your Ring app in your smartphone. This home security system allows you to control the device from anywhere. The device has the option to alert the security services provider in case you are in distress. It sends a notification to the security services provider that there is some kind of intrusion or an attempt of that. The service provider would then instantly send its police to check the situation. You can buy a 24X7 professional security monitoring of your home for $10 a month but it’s not necessary. If you subscribe to this service, the company keeps round-the-clock monitoring on your home and in case of an emergency it alerts the police. Ring Alarm is one of the most popular home security devices which can be installed without any professional assistance. It can be used without recurring cost if you don’t mind sacrificing video recording. This is a highly advanced wireless home security device is one of my favorites. It offers uncompromising protection from burglars and unauthorized entry. It works both on Android and iOS operating systems. It can send you alarms using SMS (texts), GPRS (mobile card), PSTN (phone line), and phone app. It comes with a door and window sensor. It works with WiFi and will be compatible with 3G SIM cards all across the world. This is an easy-to-use device that comes with TFT color display and a humanized menu. It also integrates well with smart assistant devices that run on speech recognition technology. The mobile app that comes with this product provides able support the alarm operation of the device. You can set and remote control the device with the app on your smartphone. It can be easily integrated into your home security and automation hub and can become a part of your home’s network alarm management. It can also be used to make a call to another phone. Kerui Security Alarm System is a perfect solution for your home security. This is a very well conceived and designed product that offers a vast array of features and facilities that are bound to surprise you. An IP camera can be added to the security alarm kit and viewed from within the same app providing you notification and setting information. Installation is very easy. You only need to insert the battery and start operating it. Everything that comes with the home security kit has been already added to the system for you you. You can download the mobile app that comes with the product on your smartphone and start using the device. After your device is connected with the internet, you can adjust it through the app. The device lets you know through alerts any attempt to trespass your property. It sends the alerts both to you and to the security service providers. Depending on the situation, you or your security service provider can alert the police. This device offers the basic function of raising an alarm when it detects smoke, fire, intrusion, or an attempt to trespass your property. Since it can become a part of your home’s overall automation and security network, it can add significant value to the existing security and automation infrastructure at your home. This is an extremely durable and weather-resistant product. It does not require a wired installation. It operates through a battery that would need a recharge after every six months. Burglaries and forced entry are two very common types of house break-in incidents. This device offers an effective solution to handle this kind of untoward situation. Kerui Security Alarm System is available on Aliexpress, which is a highly successful online retail marketplace based out of China. In the current DIY home security market, there are thousands of products from as many companies. But not all of them offer the same standards of security features. And you cannot, and rather should not take any chance with your home security. This home security device is an excellent product that boasts sophisticated technical features and high-quality performance. The security to your home depends on home security systems you install. 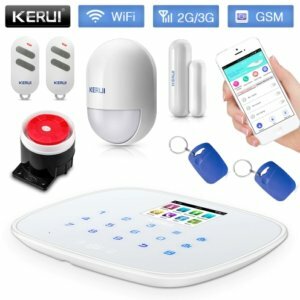 Kerui Security Alarm System is the best DIY home security system that offers free home security. Here we have reviewed and recommended five home security systems that can be installed with the DIY method and do not require any monthly contracts. 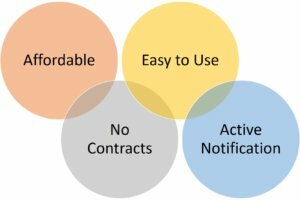 Two of the sytems do require monthly payments for additional features, but you are not locked into contract. 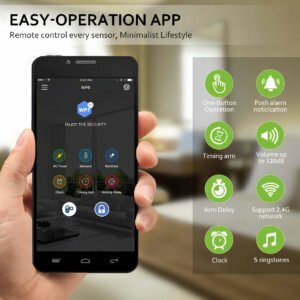 All these products are premium home security solutions that perfectly gel with your existing home automation and security network. In fact, it very aptly complements to such network. These devices keep a constant watch on your property and let you know through instant alerts if there is any mishap such as a fire or burglary incident. If you are planning to buy a home security system, this blog should act as a useful reference in your search for the perfect solution to all your home security concerns. Disclosure: As an eBay / Amazon / Alibaba Associate I may earn from qualifying purchases.